This article is about further extensions for Firebug, which can extend Firebug from its basic feature for web development by installing additional extensions (that is also a Firefox add-on). 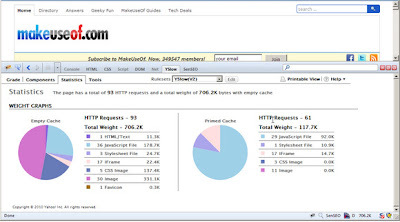 If you’re still new in what is Firebug and how to use it, there is an extensive tutorial here at Makeuseof about “Amateur’s Guide To Customizing Website Design With Firebug”. YSlow(V2) – this ruleset contains the 22 rules listed above. Classic(V1)- this ruleset contains the first 13 rules listed above. Small Site or Blog- this ruleset contains 14 rules that are applicable to small web sites or blogs. 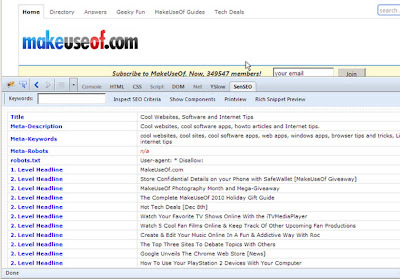 You can install the YSlow extensions here and the full guide for the extensions here . As you can see in the screenshot, it shows all of the component that are needed for search engine optimization, from h1 to h6, meta description and keyword, the alt attribute in images and it even show how the search engine read the website trough visible content. You can install the extensions from here. 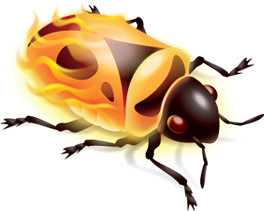 There are others popular extensions like Flashbug (displays all the running .SWF file trace output), FireQuery (plugin for jQuery development), you can see it at “Firebug Extensions add-on page”, The extensions is ranked by its popularity and the complete list is in the official “wiki for list of all Firebug extensions.”.